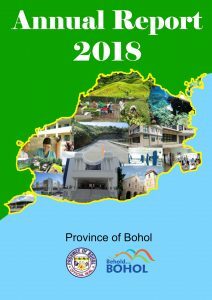 For my third and final term as Governor of Bohol, I am reporting our accomplishments through our ninth and last Provincial Annual Report. Our dreams would never have seen reality if not for the unwavering support and harmony of the Sangguniang Panlalawigan. We have always believed in shared leadership from the start, and this was clear in the way we crafted our plans and programs. 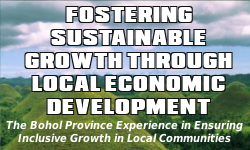 As a result of sustained consultation, collaboration and shared leadership with out stakeholders, the Provincial Government Development Framework has continually evolved … from “HEAT Bohol, LIFE HELPS” in 2010-2013, to “HEAT-IT Bohol HELPS LIFE towards the BIG LEAP” in 2013-2016, to the current “InSPIRED HEAT-IT Bohol towards the BIG LEAP” from 2016-2019. The results of our good governance and shared leadership speak for themselves as evidenced by our consistently improving socio-economic indicators: increased investments, bank deposits, tourists, air passenger traffic, number of flights, vehicles registration, and activities at Bohol’s seaports. Statistics show that Bohol is the food basket of Region 7, accounting for 86.4% of the region’s rice production from 2016-2018. Despite all this development, our crime incidence has consistently decreased yearly and our employment rate has also consistently increased — a record high of 96.3%! Local economy has been growing at an average rate of 9.1%, much higher than the national average of 6.7%. With an extremely high poverty incidence in Year 2000 at 50.2%, Bohol has an unprecedented 21.7% in 2015, lower than the regional average. Our major accomplishments are highlighted in each of our development pillars. As an affirmation of our good governance, we have received various awards and recognition as a result of Executive-Legislative unity, enabling us to excel in the areas of administrative, social, economic and environmental governance, as well as transparency, participation and financial accountability. As always, we do not rest on our laurels. As we bid farewell as local chief executive, we are happy to endorse our 12-year Provincial Development and Physical Framework Plan, our mother plan for the province, to the incoming administration. Our forthcoming major projects have already started but our proposed major projects, favorably endorsed by our Provincial Development Council, as still in the conceptualization stage, and will require the efforts of the next administration to be realized. Again, these are dreams. But just like before, we started also with dreams, and are now seeing them through to reality. Thus, we pose this challenge to the next administration, to continue with Bohol’s development trajectory.